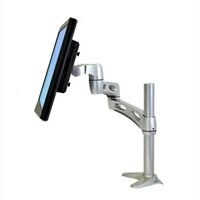 Ergotron Neo-Flex® Extend LCD Mounting ArmGet the ideal versatility with the Neo-Flex® Extend LCD Arm from Ergotron®. Utilizing pivot motion technology, the arm provides mounting platform for LCD displays weighing from 7 - 20 lbs. It features a 3-point telescoping motion which allows you to position your LCD for the ideal viewing angle and viewing distance. Sleek and streamlined, it frees up space and helps reduce eye, back and neck strain for optimum comfort. The LCD arm offers a vertical lift range of up to 22 inch extension range. With internal cable management and a sleek design, this Neo-Flex Extend LCD Arm is ideal for home and office use, especially in situations where several people use the same display. Extends LCD out up to 22"
Get the ideal versatility with the Neo-Flex® Extend LCD Arm from Ergotron®. Utilizing pivot motion technology, the arm provides mounting platform for LCD displays weighing from 7 - 20 lbs. It features a 3-point telescoping motion which allows you to position your LCD for the ideal viewing angle and viewing distance. Sleek and streamlined, it frees up space and helps reduce eye, back and neck strain for optimum comfort. The LCD arm offers a vertical lift range of up to 22 inch extension range. With internal cable management and a sleek design, this Neo-Flex Extend LCD Arm is ideal for home and office use, especially in situations where several people use the same display.